Holy Trinity Presents Mary Poppins! Holy Trinity Catholic High School is excited to announce that tickets are now on sale for the 2018-19 Trinity Festival of Art’s main stage musical, Mary Poppins: The Broadway Musical. Set to hit the stage at the Suncor Energy Centre for Performing Arts on December 14, students are looking forward to bringing their version of the classic musical to life. To purchase tickets please follow this link. After celebrating outstanding success with three sold-out public shows, two sold-out school shows, and great buzz around the community with last year’s Shrek: The Musical, the Mary Poppins production team is working hard to harness this positive momentum in order to create a show that will delight, impress, and amuse audience members. “We believe that our main stage musical is more than your typical high school musical production. With the extraordinary talents of our students, the experience and passion of our show leaders, and the fortunate partnership with the Suncor Energy Centre for the Performing Arts, we are able to produce a high-quality performance that helps us to be one of the performing arts heartbeats of our region,” commented Principal Lisa Hilsenteger. Under the direction of Mrs. Nancy Lawson, who has been fostering the acting and vocal talents of our region’s emerging artists for over 20 years, Mary Poppins will feature more than 50 students from grades 7 through 12 who are handling everything both on and off the stage. “I’ve decided to do something unique this year with our casting. In order to maximize the opportunities for students, we have actually double-cast almost all of the major roles in the production. This has been an interesting experience as two students share one role, which allows them to work together to learn their character, songs, dances, etc. Each cast will perform twice, with the fifth show coming down to a coin toss,” said Lawson. “You can expect to enjoy an exciting evening that features classics like ‘Spoon full of Sugar’, ‘Supercalifragilisticexpiadlidocious’, and ‘Step-in-Time’, along with keen storytelling and eye-catching props and costumes,” continued Lawson. Holy Trinity is proud to offer an intensive Theatre Academy for students in grades 10-12, which runs daily for 90 minutes in our state-of-the-art performance space. Students enrolled in the academy form the root of the production and performance team for the musical. After this, they transition to producing, directing, and performing in TrinFringe, the school’s one-act play festival that shows in May. “Over the last 18 months, we have been working hard to revision our performing arts programming at Holy Trinity. Our Theatre Academy is a critical component of our strategic plan as it has allowed us to offer over 30 students daily intensive skill development in a professional-grade space. In addition to our Theatre Academy, we have over 300 students enrolled in our Dance Academy and Dance Elective program and close to 30 students in our newly unveiled Jazz Band Academy. As well, we have jam-packed classes in our regular drama, vocal arts, band, and media arts programs,” commented Hilsenteger. 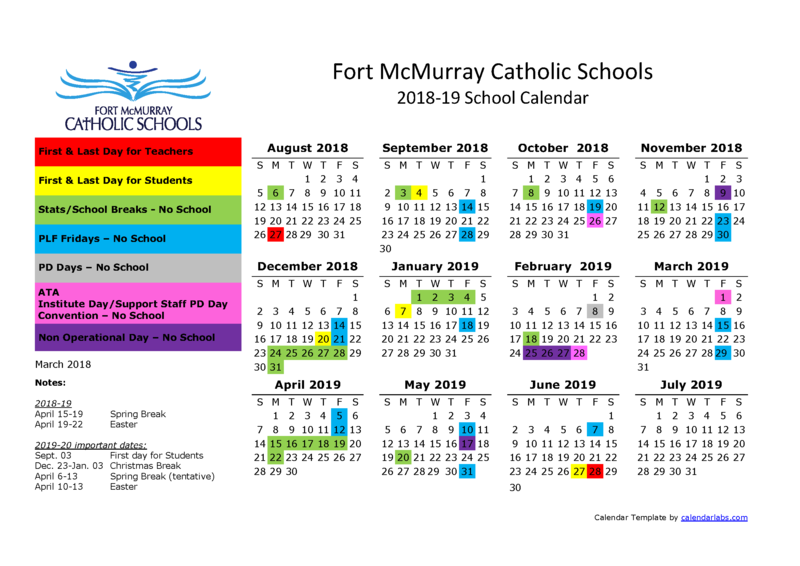 The Holy Trinity arts team is also excited to be adding a second main-stage production to this year’s season, however this show comes with a twist – it will be a FMCSD-wide production featuring both students and staff. “This April, we will be presenting a dramatic and musical rendition of the Stations of the Cross called ‘The Way of the Cross’. This show will feature younger students from our elementary schools, staff from across the district in the adult roles, and singers and instrumentalists from both high schools. Holy Trinity truly strives to be the Wood Buffalo Region’s top-choice for arts education,” continued Hilsenteger. Though Mary Poppins is not a Christmas-themed show, producers believe that presenting it in the holiday season is a smart idea. “We know that many people are looking for family-friendly events this time of year, and while the show is not based on Christmas per say, it will still leave audience members of any age with warm hearts and lifted spirits – What more can you ask for during the holiday season?” commented Lawson. 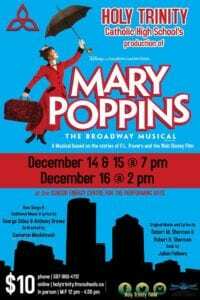 Mary Poppins: The Broadway Musical runs at the Suncor Energy Centre for Performing Arts on December 14 and 15 at 7:00 pm and December 16 at 2:00 pm. Tickets are $10 each and are available online at holytrinity.fmcschools.ca, via phone at 587-960-4112, or in person Monday to Friday from 12:00 pm – 4:30 pm at the SECPA box office.